My full name is Matthew John Hayes Sinclair. The Hayes is not without meaning, it is the surname of my great, great grandfather. Before he died my paternal grandfather wrote a book setting down his life story. My uncle had it printed and very generously gave all of my grandfather's, rather numerous, descendants a copy. "I now believe that John Samuel Sinclair never existed and was simply a fictitious person of that surname concocted by my grandmother at the time she decided to adopt the name of Sinclair, and only necessary in order to complete my father's birth certificate. In my own lifetime no one in the family has ever mentioned meeting or knowing a John Samuel Sinclair and no photograph or picture of him has ever been found. I can submit two further facts that, although circumstantial, clearly indicate that the fictitious figure of a John Samuel Sinclair was merely a subterfuge to hide the real name of my paternal grandfather. Why did my paternal grandmother decide upon the use of the name of 'Sinclair'? A clue lies in a Burial Grant issues in consideration of a fee of Five Pounds and Five Shillings to Mrs Annie Sinclair granting exclusive rights of burial in a grave No: 4669 at Hanwell Cemetery in the county of Middlesex. This document is dated November 19th 1902; only some four years after the birth of my father and it records my grandmother Anne Darby's address at that time as being 67, Bolingbroke Road, West Kensington, London. 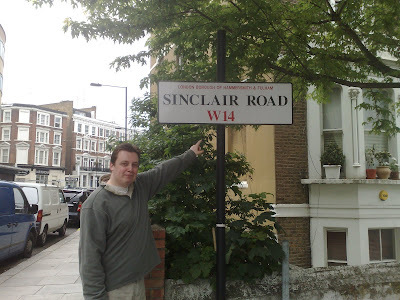 One has only to look at a street map of the Kensington area of London to see that Bolingbroke Road is only a stone's throw from 'Sinclair Gardens' and 'Sinclair Road'. It is easy to imagine that if that area of the city held some affection for Anne Darby she could well have decided to adopt the name as her own and passed it on to her son and his consequential heirs by falsifying the birth certificate." He goes on to discuss how his records show that a John Samuel Hayes is likely the real father and the new name was probably designed to cover up the child's illegitimacy. I've known about this for a while. I'm the only one of my generation to carry Hayes and the link to events more than a century ago is fascinating. It took until a few weeks ago, though, for me to have the idea of trying to find the two roads (Sinclair Gardens isn't actually a park) my family are named for. 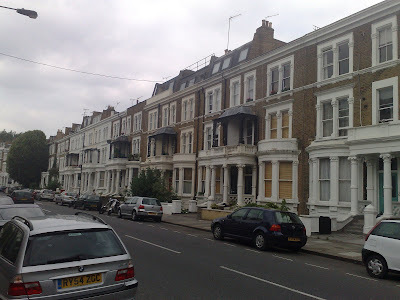 It is an unremarkable but quite pleasant road near Kensington Olympia station most obviously notable for the cast iron shelters over some of the mini-balconies. I now have a fierce ambition to eventually own one of those houses! The only down side might be that if I ordered something delivered to Matthew Sinclair, 76 Sinclair Road it would sound like a hoax. Further wandering yielded this. Who would have thought it. 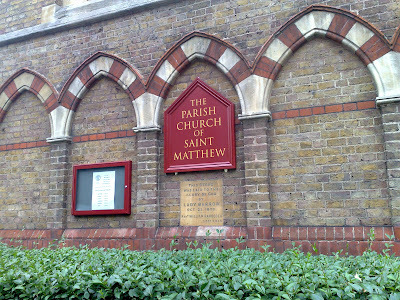 The Parish Church of St. Matthew, Sinclair Road. What are the odds! Apologies for the break from normal service. I'm afraid a near dead laptop has made blogging a bit difficult. I'll return to politics soon enough. SOme positive feedback here ... don't worry about the change of tack Matthew, skip the politics, you've found your track now, stay on it, this was a grand and interesting posting. Why not make your blog the tale of your pursuit of ownership of a place on Sinclair Road, a fine blend of the personal and capitalism that seems political enough? Hello, i would like to know more about this topic because looks interesting and i need to find information to finish a college project. Olive Shop is an online boutique of Olive Products. We collect premium extra virgin olive oils, organic olive oils, black and green olives, olive cosmetics and almost everything that is produced from the Olive tree. There is not border at the internet world. You can reach any place online with mouse clicks. Its enables us to sign up a learning program even it is offered by an institute that is located any where on the earth as long as the institute makes it learning programs available for distance learners. The fire was the only source of light in the room; it cast long, spidery shadows upon the walls. Frank stared at the back of the armchair; the man inside it seemed to be even smaller than his ser¬vant, for Frank couldn’t even see the back of his head. “You heard everything, Muggle?” said the cold voice. “What’s that you’re calling me?” said Frank defiantly, for now that he was inside the room, now that the time had come for some sort of action, he felt braver; it had always been so in the war.